Zen master Thick Nhat Hanh, bestselling author of Peace is Every Step and one of the most respected and celebrated religious leaders in the world, delivers a powerful path to happiness through mastering life's most important skill. Communication fuels the ties that bind, whether in relationships, business, or everyday interactions. Most of us, however, have never been taught the fundamental skills of communication--or how to best represent our true selves. Effective communication is as important to our well-being and happiness as the food we put into our bodies. It can be either healthy (and nourishing) or toxic (and destructive). In this precise and practical guide, Zen master and Buddhist monk Thick Nhat Hanh reveals how to listen mindfully and express your fullest and most authentic self. 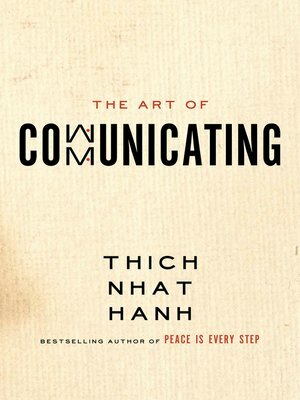 With examples from his work with couples, families, and international conflicts, The Art of Communicating helps us move beyond the perils and frustrations of misrepresentation and misunderstanding to learn the listening and speaking skills that will forever change how we experience and impact the world.